Boston Magazine gave this little restaurant the coveted 'Best Burrito in Boston' award in 2004, in the face of stiff competition. Commonly called El Pelon, this place is famous for its pepper contests and proximity to the home of the Red Sox, Fenway Park (Map). 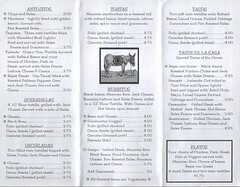 The menu offers your standard burrito fare, plus fish and plantains. Check out their wesite here. Friday, March 25, 2005 by Jonah. The El Pelon burrito was another quality burrito. The location has limited space, so this is not a place to go for a relaxing lunch. Also beware of poor service and El Pelon's soda machine. I purchased a small soda only to find out the machine was broken. The cashies said the machine would be fixed shortly, but it never was and no refund was given. el pelon has fanTAStic burritos - they're yummy, cheap, huge, and i never get sick of them. el pelon also has a "buy 10 burritos get 1 free" punch card, which totally comes in handy when i'm short on la pesos. oh, and the fried plaintains are absolutely amazing. woo! Shocking review of the very popular fish taco. You've gotta try the awesome El Guapo, which is more appropriate for the burrito blog. Very surprised to see a bad review. I eat at El Pelon 3-5x per week and think the Fish Tacos are one of the jewels of the menu. I highly recommend the burritos, salad, tamales, and the hot hot sauce. Also, ask for the not listed "Fish Guapo" burrito. Brilliant! I haven't had a better buritto in Boston yet than than the chicken burrito with everything and extra hot sauce at El Pelon. The chorizo buritto with everything and extra hot sauce at Boca is a close second. I'm anxious to try some of the places in JP. while watching the Phantom Gourmet on tv we decided to try El Pelon Taqueria so off we went. We ordered the taquitos, chicken and el gaupo burrito. We enjoyed the food but my husband asked for his extra hot and found it not to be. I wasn't sure if it was your place or another that had the drink that I wanted to try but when I asked the girl taking the order she couldn't answer any of my questions because she didn't understand English. when I got home I looked on your menu and it told me what it was which was the horchata and agua de jamaica. I was disappointed that I had to settle for a watered down root beer. I'm not sure if it was worth the trip. I think you need to give the fish tacos another chance or at least elaborate on why you didn't like them. What kind of review is that? They are probably my favorite 'fast food' item in Boston. They are amazingly tasty. 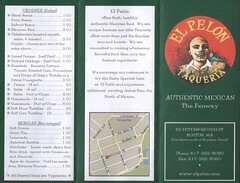 El Pelon is the King of Burrito spots in the city of boston. As the concierge of a major hotel I should know a little bit about eating out, and El Pelon offers some of the freshest ingredients as well as an excellent product. this site should get a better burrito reviewer. I completely agree that they are fantastic. the girl at the counter remembered my name 5 days after my first visit and that in itself is impressive. im vegetarian, and find their veggie burritos the best in the city.